LLS, officially launched in early 2011, has brought together a talented team of resourceful individuals with a unique and unparalleled skill set that leverages a diverse range of capabilities with common, unwavering commitment to the customer. By coupling these attributes with a “common- sense” approach to problem solving LLS is focused on providing value to customers through developing high quality solutions based on innovative and resourceful engineering. 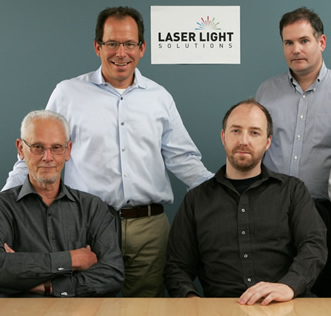 With over 6 decades of combined experience and a keen understanding of both laser technology and business environment, LLS is uniquely positioned to deliver value to its customers through a number of products and services, including; laser diode (LD) based system development, OEM system manufacturing, LD process support, LD technology transfer, business support and optimization. LLS is a subchapter C corporation and registered in the state of New Jersey. Privately owned and operated by the active managers of the company shown above. * The LLS management team, comprised of the the former founders of High Power Devices (Intense), a high power laser diode manufacturing company. Since its inception in 1995 HPD delivered (and continues to deliver) millions of LDs to a diverse cross-section of LD markets and applications. As one of the largest US based LD manufacturers grounded in the principles of lean manufacturing and engineering, HPD flourished as a profitable, growing enterprise through 2007 when it was purchased by Intense.